LÄRABAR® Truffles™ are delicious truffle-like bites made from real food to satisfy your sweet craving! All 10 indulgent flavors are made from just 5-8 simple ingredients and are gluten free, non-GMO, vegan, and dairy free. LÄRABAR® Fruits + Greens™ combines bright, fruity flavor with 1/4 cup of nutrient-rich greens in every bar! Whether you're rushing out the door in the morning or looking for a quick afternoon pick-me-up, Fruit + Greens makes it easy to grab and go. All 3 flavors are made from just 5 simple ingredients, and are gluten free, dairy free, non-GMO, Kosher, and vegan. 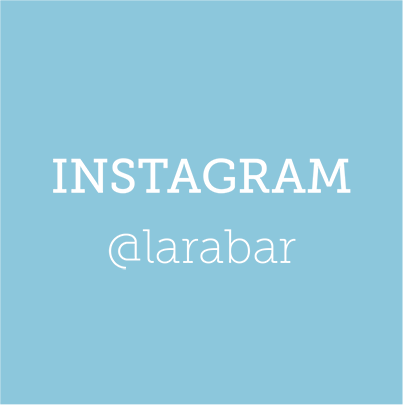 LÄRABAR® Nut & Seed™ is a delicious baked crunchy bar made from real, simple ingredients, including almonds and pumpkin seeds. With no more than 9 ingredients and a crunchy yet chewy texture, each flavor is gluten free, and non-GMO. LÄRABAR® Organic with Superfoods™ is a delicious blend of fruits, nuts and powerful superfood ingredients such as kale, hemp seeds, turmeric, and cacao nibs that pack a punch! Each flavor is made with only 6 ingredients and is USDA Organic, gluten free, non-GMO, vegan, dairy free, and soy free. LÄRABAR® Kid™ is baked with love using 9 or fewer pantry ingredients. This wholesome bar fuels kids for a lifetime of adventure, imagination, and delight.